While most were busy watching four-time Formula 1 champion Sebastien Vettel f-bomb the living hell out of Red Bull successor Daniel Kyvat, an old mate of crankandpiston.com – Jordan Butters – stopped by the Drift Allstars weekend at Lydden Hill to check out the tyre-melting drift action. 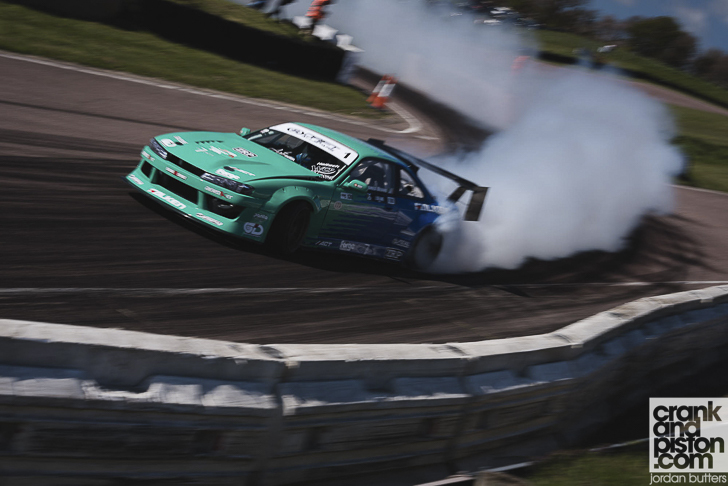 If James Deane was a notable absence from the 2016 Drift Allstars season opener in Abu Dhabi, the Irishman wasted little time at Lydden Hill, UK, reminding everyone who was reigning champion, taking the first victory of both his title defence in style and the European leg of this year’s Drift Allstars championship. At one stage though, victory looked far from certain for most of the pre-event favourites. Technical issues on his LS-powered S13 sidelined Abu Dhabi winner Stephen ‘Baggsy’ Biagoni early on, the Brit failing to complete either of his qualifying runs (let’s be honest though, as bad press for high profile energy drinks went this past weekend, Monster Energy’s woes paled in comparison to Red Bull’s…). Two in a row then for crankandpiston.com on the Drift Allstars 2016 campaign tour on only our second visit to Lydden Hill (you can find the first one HERE). Generous benefactors always welcome for the third round in Ireland, then again teams/drivers/sponsors/overly enthusiastic fans could always give snapper Jordan a bell. As you can tell by the images, he’s quite a talented chap!